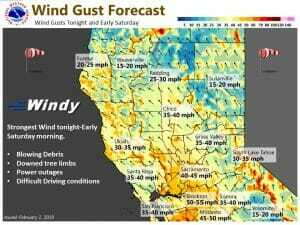 February 1, 2019 – A series of storms will bring hazardous weather to northern California Friday through Monday. 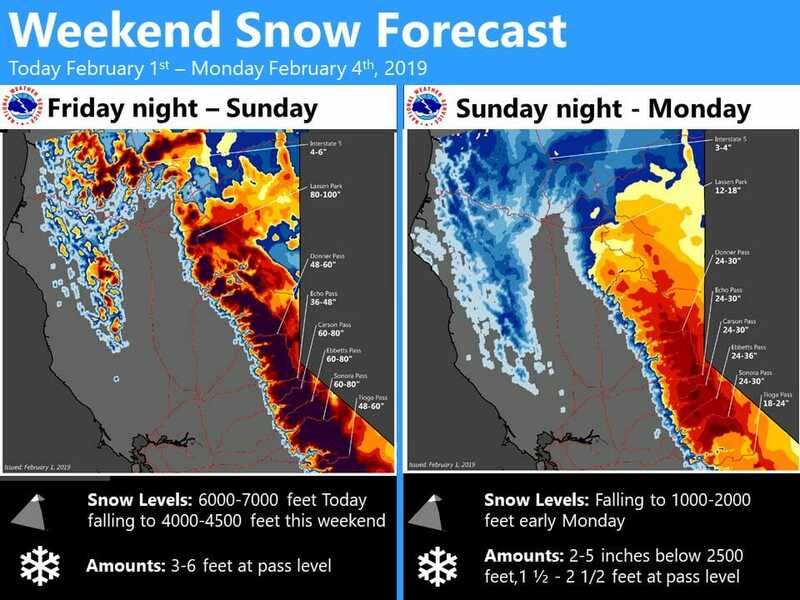 The first system will move into the region tonight and then continue through Saturday bringing with it significant mountain snow, moderate to heavy Valley rain, and strong winds at times. 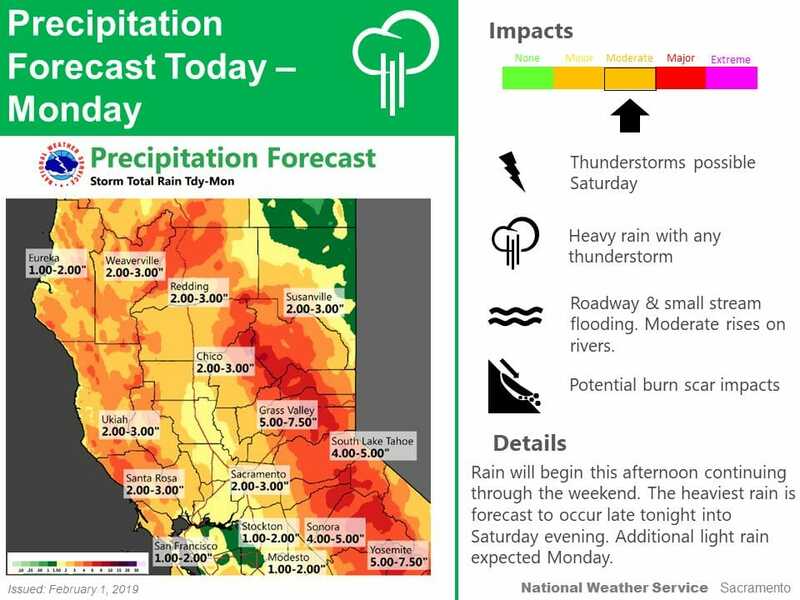 Valley thunderstorms possible Saturday afternoon as well. A second, but colder storm system will start to move into the region on Sunday which will drop snow levels significantly on Monday. Drier conditions return to the region by midweek. Winter Storm Warning from 4 PM this afternoon to 10 PM PST Monday for Motherlode-Mountains Southwestern Shasta County to Northern Lake County-Northeast Foothills/Sacramento Valley- Shasta Lake Area / Northern Shasta County-West Slope Northern Sierra Nevada-Western Plumas County/Lassen Park. Cloud cover and areas of light valley fog this morning ahead of a strong cold front expected to move onshore later today. Short wave troughs pivoting out ahead of the front may bring some light precipitation to the northern zones of the forecast area as early as later this morning and a chance of precipitation over the entire CWA by this afternoon. For the most part this precipitation should remain light with little in the way of impacts. Daytime highs should come in right around normal. Things change quickly after 00z this afternoon as the main frontal band moves onshore. 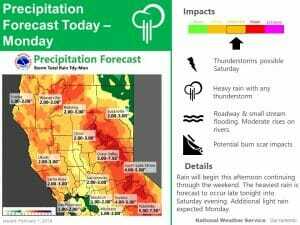 Moderate to heavy rain and higher elevation snow move over NorCal during the night. Will need to watch for debris flow issues over the burn scar areas during the tonight and early Saturday timeframe. 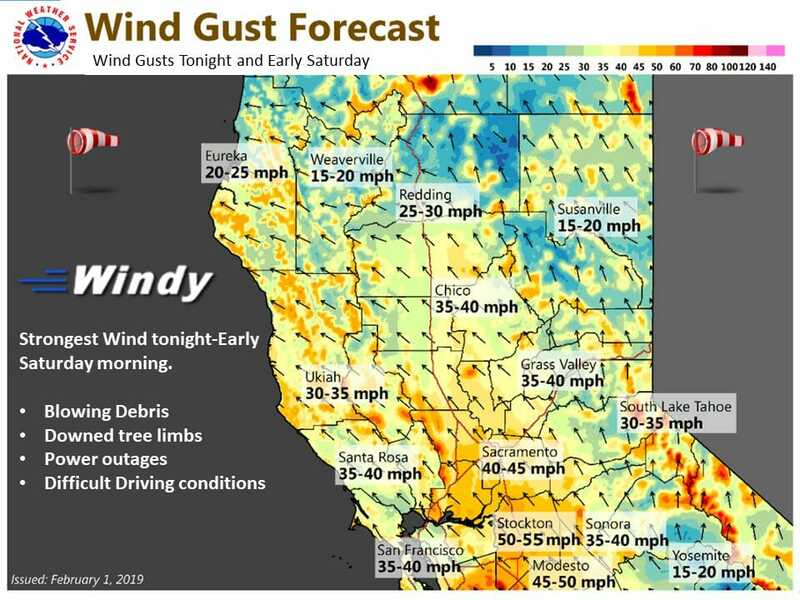 With the main surface low still off the coast, surface gradients are not conducive to a strong south wind but 925 mb forecast progs indicate wind gusts over 40 mph possible over the central part of the state and a wind advisory for this area will stay in place tonight and Saturday morning. Snow levels remain above 4000 feet through the day on Saturday so removed the winter storm warning below these elevations. Frontal band timing shows the front moving into the Sierra late Saturday afternoon or slightly slower that previous forecasts. Models showing enough instability for isolated thunderstorms Saturday afternoon but extensive cloud cover will limit surface warming. Winds should drop off fairly quickly as the front passes to the east. Upper low moves through Saturday night so showers continue. May see a decrease in precipitation Sunday morning before next Pacific trough pushes on to the coast Sunday afternoon. 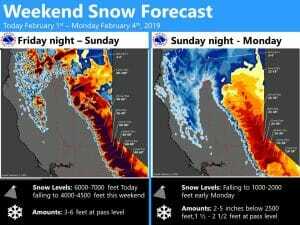 This colder system will bring a drop in snow levels with snowfall possibly impacting the coast range passes by late in the day Sunday. Frontal passage with this system appears to be Sunday night and Monday morning. Although this system will be drier than the previous one, it will be much colder dropping snow levels down the 1000 feet or lower across Shasta county by Monday evening in the cold air behind the front. 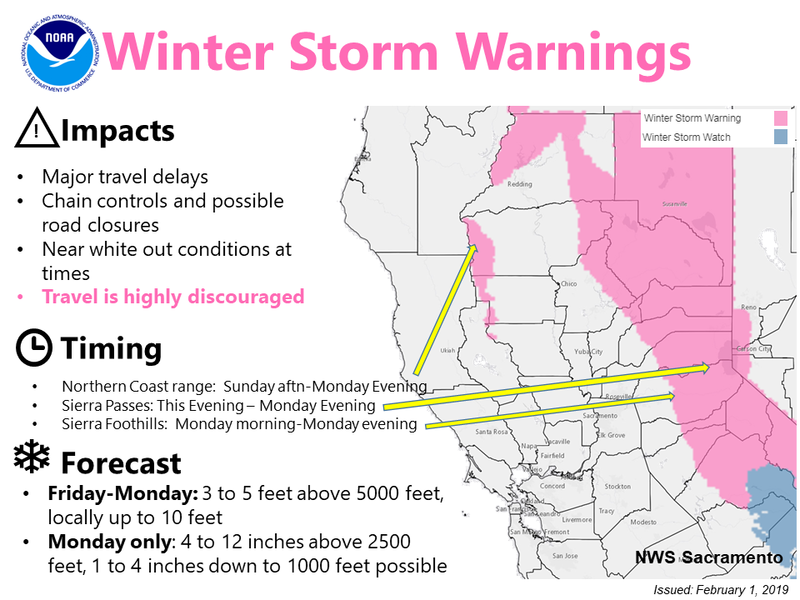 Adjusted winter storm warning for these lower elevations to better match timing of cold air. Upper low dropping into the northwest corner of the state keeps showers going Monday night. Cold 526 DM upper low drops along the CA coast early Tuesday, tracking inland Tuesday afternoon into night. With significantly colder air in place, potential for some morning rain/snow mix down to around 500 feet. Cold unstable pattern will also be favorable for thunderstorm development, so have added some for the afternoon. With 5h temps around -34 Deg C, potential exists for stronger storms to produce hail. Drier northerly flow develops over Interior NorCal Wed as system pushes into the Great Basin and EPAC upper ridging approaches. Dry weather expected through the remainder of the week.